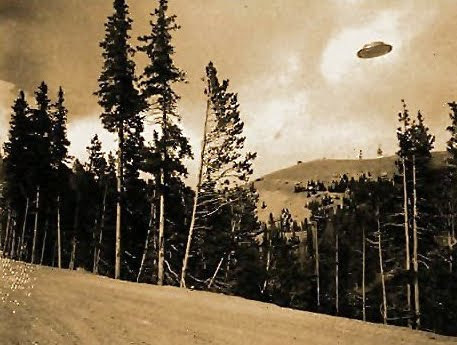 This photograph is most often considered to be the first legitimate UFO picture taken from the summit of Mount Washington in New Hampshire, USA in 1870. 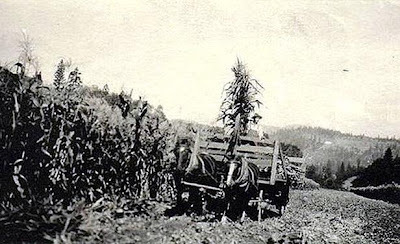 The only thing know about this picture is that it was taken somewhere in the United States in the early 1920's. The hilly terrain indicates that it could be on either the west or east coast and is less likely in the central flat part of the country. This photo was taken at Cave Junction, Oregon in the early to mid 1920's. Many people say it is too clear and too good to be that old, if anyone has seen Ansel Adams photos knows that pictures of that era are some of the best ever taken. 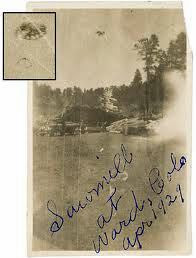 This intriguing picture is taken over a sawmill in Colorado in 1929. 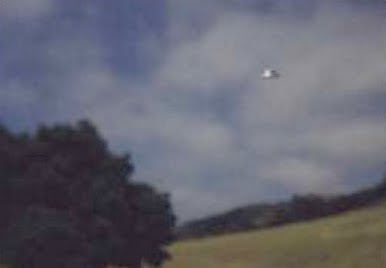 No further specifics were given along with this photograph but the enlargement of the UFO provides some interesting detail. 1932-St. Paris, Ohio. 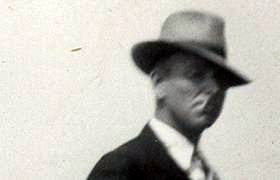 This picture was taken of a man named George Sutton near midday May 1932. 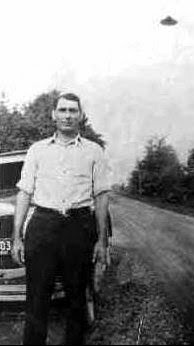 We can see that it was in 1932 from the license plate on the automobile in the photo that accompanied this shot. 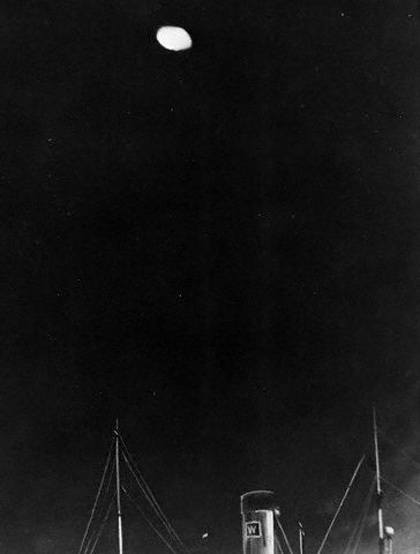 The unidentified flying object in the picture could not have been a street lamp, simply because there were no street lamps at the time. There are no power poles or power lines visible anywhere in this picture. This picture shows a vintage automobile. The owner of the photo album says there were no electric street lights along this road in those days. 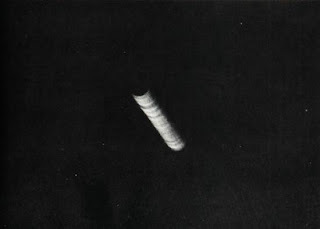 Nobody has been able to account for the dark object seen over Sutton's left shoulder in this photograph. This image only is described as "New Year Day 1939" somewhere in the United States. This is certainly not the day to day image of how people looked back in the 1930's. The suit and hat would have been reserved for Sunday Morning church services or special events or holidays such as New Year Day. 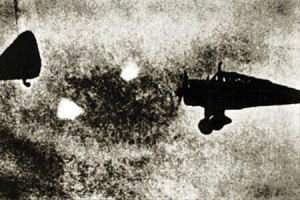 The so called foo fighters were fairly common in the Atlantic and the Pacific during WWII, they were bright lights the seemingly flew just in front of or along side aircraft, particularly fighter craft but not confined to fighters. 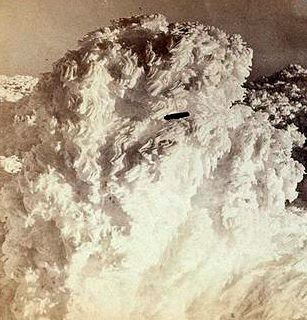 When the pilots attempted to chase or follow them they would rapidly disappear. 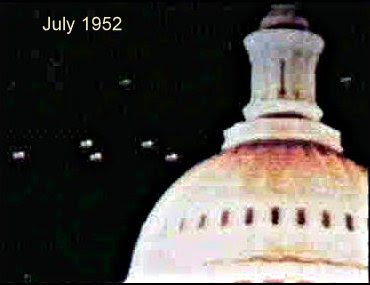 While this was not a common occurrence it did happen on many occassions, there are even incidences of the foo fighter coming along side war ships. 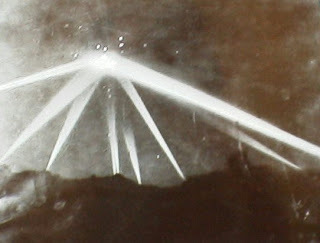 Commonly called the battle over Los Angeles happened on Feb 25, 1942, There were 1500 heavy artillery shells fired at this UFO and with a single direct hit. Thousand of people witness the UFO as it lazily lumber south towards San Diego California. There were a few people injured and even one death reported. 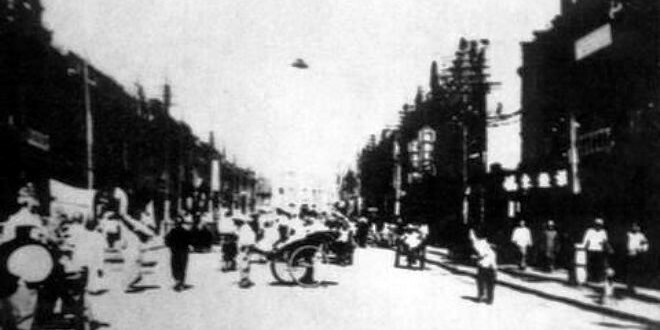 Young Japanese student Masujiro Kiryu, going through his fathers scrapbook of photographs from the China Campaign, just before World War II, discovered a strange cone-shaped object in the sky above a Tsientsien Street. A number of people in the street are looking up and two are pointing up at the object. Young Japanese student Masujiro Kiryu, going through his fathers scrapbook of photographs fro the China Campaign, just before World War II, discovered a strange cone-shaped object in the sky above a Tsientsien Street. A number of people in the street are looking up and two are pointing up at the object. A sidewalk photographer snapped a picture of the strange machine and his father bought it from the street vendor for a souvenir of the place. 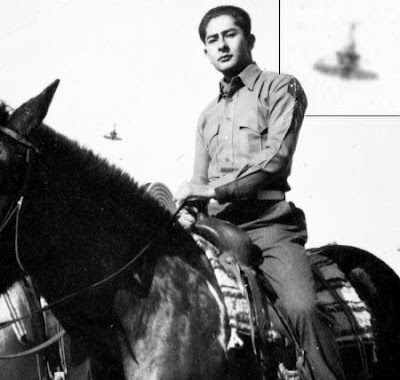 Jack LeMonde was photographed on horseback near the Pickwick Riding stables in Burbank, California on a June morning in 1945. LeMonde was in full military uniform, having served in the South Pacific with the US Marine Corps. 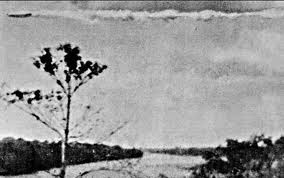 But something strange appeared in the photo, once developed. 1947 - Scotland. 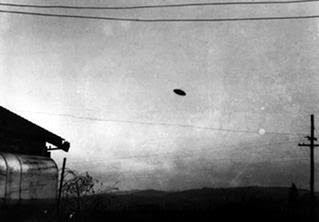 An alleged UFO picture taken in the Outer Hebrides in Scotland in 1947. It is important to see the original picture on this one to get the full effect. This, to me, is a very good picture of an object that is not identifiable by comparision to any known aircraft today. It is obviously a metallic, two layered object which has never been explained away. 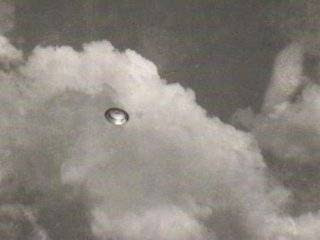 A true UFO! 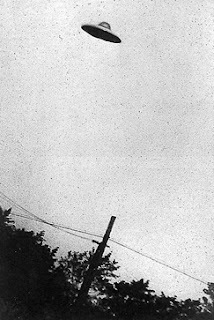 McMinnville Oregon May 11, 1950 experts have worked for decades to debunk the photos taken from Paul and Evelyn Trent's back yard on May 11, 1950A June 10, 1950, story in The Oregonian reports that Evelyn Trent was outside feeding the rabbits on the family farm near Dayton, about 11 miles south of McMinnville, when she saw a strange metallic object in the sky. She yelled for her husband, who grabbed a camera and ran outside. 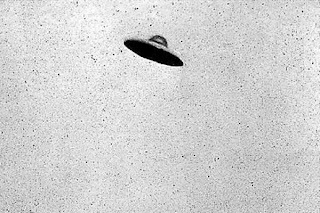 The Trents told The Oregonian that the saucer came from the northeast at about 7:45 p.m., changed direction, then slipped out of sight. "It was like a good-sized parachute canopy without the strings, only silvery bright mixed with bronze," she said at the time. "It was as pretty as anything I ever saw." 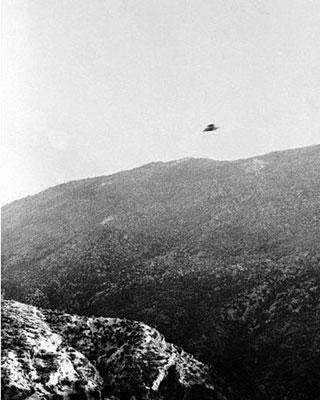 Guy B. Marquand, Jr., took this picture on a mountain road near Riverside, California, on November 23, 1951. 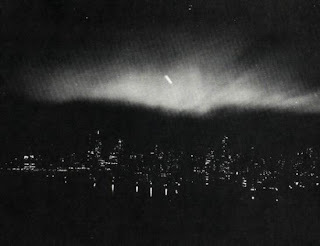 He said the object above the skyline was a "flying saucer"
This photo was taken the same as Roswell but it was also taken on anniversary of the UFOs over the White House, which occurred July 7, 1952. 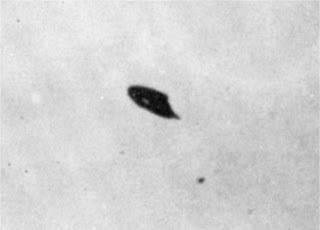 1947 - July 7 - William Rhodes of Phoenix, Arizona allegedly saw a disk circling his locality during sunset and took two photographs. 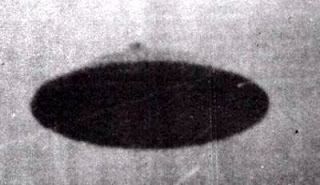 The resulting pictures show a disk-like object with a round front and a square tail in plane form. 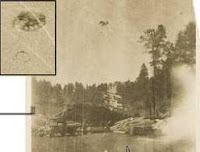 These photographs have been examined by experts who state they are true photographic images and do not appear to be an imperfection in the emulsion or in the lens.